We love having guests return to stay with us again and again. We are thrilled to know our beautiful historic hotel, and Southern hospitality exceeded your expectations for a spectacular stay. We will share your compliments with Anthony for the job well done. We hope The Georgian Terrace is your first choice every time you visit Atlanta. Thank you for being our guest! We recognize your time is valuable and appreciate the feedback you have provided for The Georgian Terrace. We are delighted to read how much you liked our beautiful property, hospitality, and spacious accommodations. It was our pleasure hosting you during your time in Atlanta, and we look forward to your next visit. The reason for only 4 stars is because we had an absolutely horrible experience with one of the bartenders on our last night. This was disheartening because it ruined our stay and I don't think we'd ever return. On our last night, we stopped at the bar for a drink and to say hi to our favorite bartender, Russ!!! Right away Paul was short with us started making extremely rude comments to me. He continued to mutter things under his breath and was saying things to his fellow employees and customers. I confronted him and his response brought me to tears. He is not an employee I'd want working at my establishment. And after spending close to $1000 there, we won't be returning. Our gratitude for reviewing your stay at The Georgian Terrace. We are happy you liked our beautiful property and friendly front desk staff. However, we apologize that our associate was rude to you. We will be working with the appropriate department managers to see where we fell short and to ensure it does not happen again. Thank you for bringing this to our attention, and we hope you will give us a second chance. 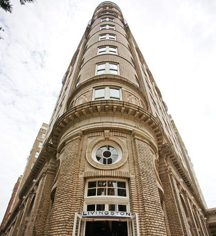 We stayed weekend in downtown Atlanta and since we had an event at the Fox Theatre we chose this hotel due to location. 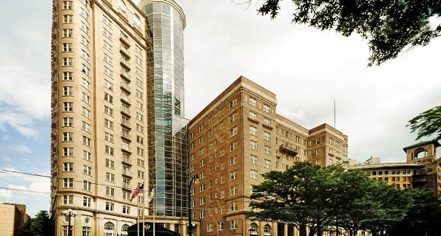 It is a gorgeous hotel with charm and easy access to entertainment at The Fox Theatre. We had a room on 2nd floor with great view of street and The Fox which got to be a little loud after dark (if your in a room facing Peachtree Street. But overall worth it. Roof top view was great but wish there was more seating area. Front patio was great for people watching but felt like adding some rocking chairs would've made the "southern charm" a plus! Also wished they had "fixed" lighting in trees out front where half had missing bulbs or were not working at all. The little details like this would make it even more awesome. And several bar/restaurant within hotel. Valet parking was only $5 more than other local lots so I highly recommend doing valet ESPECIALLY if you have an event at The Fox Theatre. Overall the staff was very personable and friendly. We are delighted you chose to stay with us at The Georgian Terrace in midtown Atlanta. Thank you for the excellent rating. We are glad our convenient location made your trip pleasant. We also appreciate you mentioning that although the hotel is now more than 100 years old and on the National Register of Historic Places, it still has its original character and charm but with the added comfort and convenience of today's technology. We hope you are already planning another trip our way. Thank you for choosing The Georgian Terrace for your business visit. We are happy to know you enjoyed the food that we served and the beautiful views. It is also nice to know you loved our well-maintained accommodations and had an overall great stay. We value your feedback and look forward to your next visit.